On Nov. 6, the ICRC approved the Final Draft 10-1 Redistricting Map (set forth below and at the Final ICRC Draft Map link). Before a final vote on the Final Draft Map, there will be two public hearings, Wednesday, Nov. 13 (6:30-10 pm at the The Lodge, 700 Dawson Road) and Thursday, Nov. 14 (6:30-10 pm at the Millenium Youth Entertainment Complex, 1156 Hargrave St.). Our input is still valuable, and we can still have a say in what our city council districts look like. 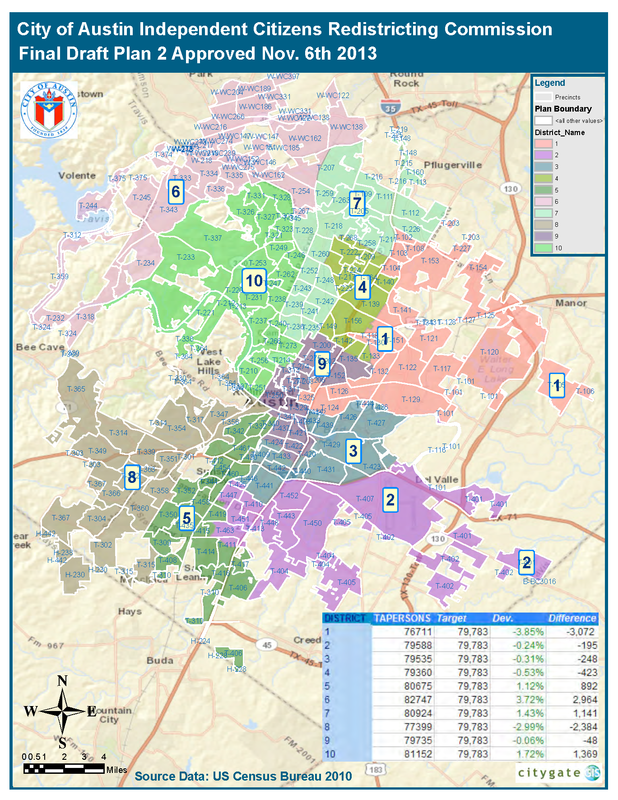 Currently, the Tarrytown neighborhood on the west side of MoPac and the Bryker Woods neighborhood are included in the new District 10, while most of the Pemberton neighborhood is included in the downtown District 9. While we are disappointed to see that our neighborhood is still divided between two districts, the final map appears to be a more reasonable mapping of districts, at least for the portion of our neighborhood on the west side of MoPac. Currently, our neighborhood on the west side of MoPac is grouped in the new northwest hills District 10 which includes the Highland Park, Balcones, and northwest hills neighborhoods without extending all the way out to Lake Travis/Williamson County. The new District 10 is a little more compact than the old District 7, but at least it doesn’t extend to Pflugerville. In addition, it seems to encompass “common social and economic interests” that are shared by largely interior, single family neighborhoods, such as land use patterns and development pressure, tear-downs, McMansions, traffic problems, rising property tax burdens, historical preservation, infill growth, short term rentals, and MoPac expansion, to name a few. CALL TO ACTION: We believe the current map is an improvement on the earlier map proposal because it groups our neighborhoods (WANG, Highland Park West, Balcones, and Bryker Woods) with the interior northwest hills neighborhoods inside Loop 360 in a central-west single family district 10, and does not lump us all with the central downtown District 9. However, there is a concerted effort by others (see posts here) to go back to the earlier map proposal wherein the northwest district 10 would divide us from the interior northwest hills neighborhoods at 2222, likely resulting in the West Austin neighborhoods being moved into the central downtown district. OUR WEST AUSTIN NEIGHBORHOOD STRONGLY SUPPORTS THE FINAL DRAFT MAP IN WHICH DISTRICT 10 EXTENDS TO LADY BIRD LAKE AND MOPAC. We believe the current District 10 groups us with our single family neighborhood communities of interest by including us with other single family neighborhoods in the interior northwest hills area near 360. However, there is a concerted effort by the Northwest Austin Coalition (see posts here) to go back to the earlier map proposal wherein the northwest district 10 would divide us from the interior northwest hills neighborhoods at 2222, likely resulting in the West Austin neighborhoods being moved into the central downtown district.